Cross posted from the November Learning blog. Michael Wesch's keynote this morning was simply breathtaking. In the follow up breakout session someone asked him: "How do you stop students seeing themselves as students, and as collaborators?" 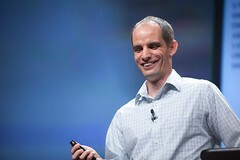 Mike sighed, put both hands on the podium and said: "That's really hard work." He went on to explain "community first." He uses the first two weeks of class to build a sense of community and togetherness in a shared quest to solve a real world problem. A problem he himself doesn't know the answer to. "Doing crazy things together creates community." 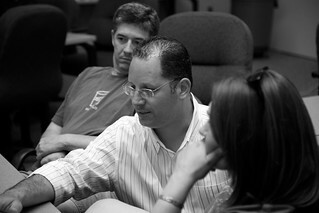 Micheal plans his most passionate and enthusiastic lectures for those first two weeks. And he has his students do zany ice-breaking activities to help them get to know each other and break through the veneer of passivity they arrive in his class with. But it's not just about having fun; these activities (like human scavenger hunts) all have a serious edge to them. They have to see that they'll have fun learning here, but we are working hard at learning. The kids begin by co-creating a schedule on a wiki for the research they'll do to solve the problem they've decided to work on. They begin by digging into the problem and reading everything they can on it. Summaries of all their reading are compiled on the wiki. Typically they'll read over 90 articles, papers, or books in the first week of class as they do this. (In more typical University classes they read about three articles in the first week.) Mike guides them, having a little deeper experience in the field then they do, by suggesting other sources they might wish to explore. They continue this research and co-create a research paper for publication. When that's all done, they create very brief condensed video summaries of their research, submit them to Mike who then weaves them together into a brief (5 min?) video. All this is only possible because of the community building work they do together in the first few weeks of the course. There's a lot more to all this, I'm just summarizing (his integrated, collaborative, calibrated peer review assessment scheme – which goes well beyond <-- that link back there – is brilliant), but that's the broad strokes takeaway I got. Sometimes, when people work together closely on a real world problem things wrong. People get upset. Students goof off in class. When that happens Mike intervenes using a ritual he learned from an African(?) tribe. It's very similar to the Talking Stick ritual used by many First Nations people of Canada. They use pencils instead. 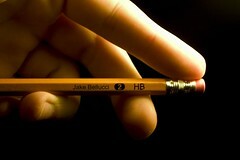 Anyone who is holding the pencil lets go of the little voice in their head that says "You can't say that." and speaks from the heart about what's upset them. The rest of the group talks with them about it. They don't put the stick down until they've resolved whatever the problem is. Mike usually goes first. Sometimes he cries while he's talking to his 400+ students. Then the next person in the group takes their turn. I've got to think more about how to weave together such a set of diverse sensitivities into my teaching. How do you build a culture of caring in your class? Riding a Paris Metro David Wong looks up at the ads. All beautiful images captioned with little text. One, an image of the Earth and a single star. 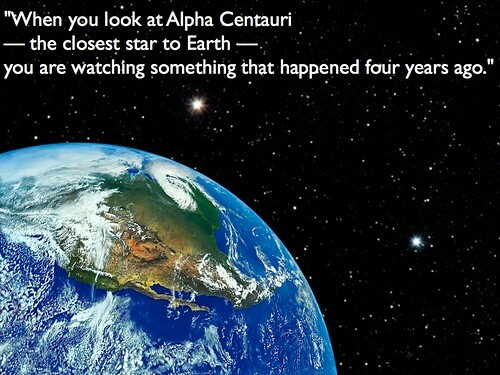 The caption: "When you look at Alpha Centauri — the closest star to Earth — you are watching something that happened four years ago." In their essay What If Ideas Were Fashion? David Wong and Danah Henriksen (from Michigan State University) explore the learning that comes of creating these images. What if we applied a fashion designer's design sense to learning? As they ask in the title of their essay: "What if ideas were fashion?" Early on they write: "The experience of fashion is often characterized by intense imagination, motivation, emotion, and thought." What if the experience of learning were characterized by intense imagination, motivation, emotion, and thought? Have you seen anything at BLC that can be characterized as 'intense imagination, motivation, emotion, and thought?" Any one of those? two? three? all four? I have. I'll mention some examples in my next post. I'm far more interested what you saw. Please share it here in the comments. Better yet, summarize it in a "slide" like one of those you'll find in Dean Shareski's flickr group Great Quotes about Learning and Change. (If you've not seen it yet I highly recommend putting aside 30 minutes or so to get lost in it.) Find a (cc) licensed flickr image that resonated with your favourite quote from the conference so far about learning and add it to the pool. Picking up on David and Danah's work I just started a new flickr group similar to Dean's. It's called Ideas with Style. It's specifically about mashing together (designing) a striking image with an educational thought, fact, or idea. Check it out, maybe add an image to that pool too. Remember: neither 'social media' nor 'design' are nouns, they're verbs, and Design Matters!